Alpha One appeared in the 1987 series episode The Foot Soldiers are Revolting. 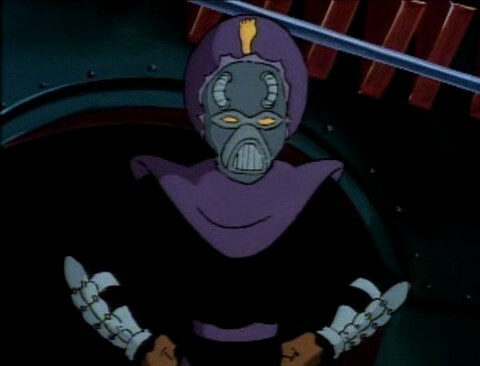 Shredder tried to replace Bebop and Rocksteady with an “intelligent” and “thinking” Foot Soldier called “Alpha One”. Because Bebop and Rocksteady are playing a video game when Krang is programming Alpha One, this causes the main computer to malfunction. The end result Alpha One comes out more intelligent than Krang and Shredder wanted. Alpha One becomes able to control the other Foot robots too. Alpha One doesn’t want to work for Krang and Shredder anymore, so he sends them away in a life pod. His plan is to transport all the humans to Dimension X so he and his robots will have control of the Earth. Alpha One ended up being defeated by the turtles who turn his Dimensional Displacement Device against him transporting him to an unknown dimension. Alpha One is the only Foot Solider who can talk. He is voiced by Townsend Coleman.